Thoracican barnacles of the Superorder Thoracicalcarea Gale, 2016 are sessile calcifiers which are ubiquitous in the intertidal zone and present from very shallow to the deepest marine environments; they also live as epiplankton on animals and detritus. The geochemical composition of their shell calcite has been shown to yield information about environmental conditions, but comprehensive analyses of barnacle shell geochemistry are so far lacking. Here, a dataset is reported for Mg/Ca, Sr/Ca, Mn/Ca, Fe/Ca, as well as carbon and oxygen isotope ratios for 42 species from the Balaniformes, Verruciformes, Scalpelliformes and Lepadiformes. Barnacles predominantly form low-Mg-calcite with very high Sr/Ca ratios averaging 4.2 mmol/mol. The Mn/Ca and Fe/Ca ratios in shell plates are variable and can exceed > 4mmol/mol in barnacles that are attached to manmade structures or live close to (anthropogenic) sources of Mn and Fe. No strong phylogenetic control on the average element/Ca ratios is observed in barnacles. The Balaniformes show a ca. 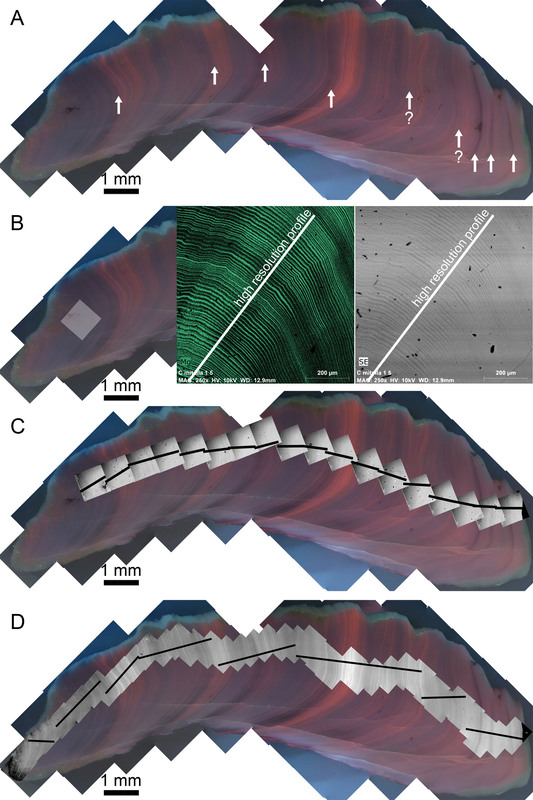 40 % enrichment of Mg in their scuta and terga as compared to other shell plates — a pattern which is not seen in other barnacles. 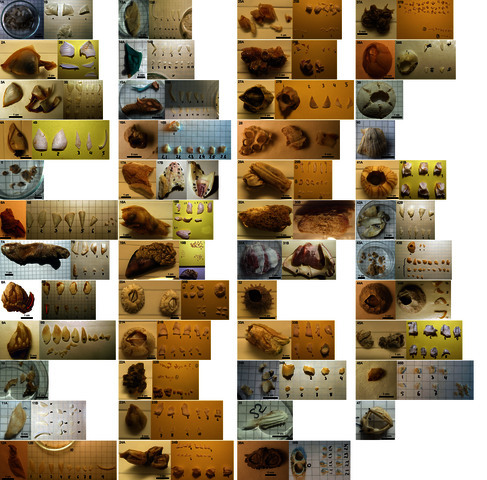 The combination of low to medium Mg/Ca ratios and high Sr/Ca ratios is rare for marine biogenic calcite and Barnacles may thus become important for robustly reconstructing past seawater composition, if this signature is also present in fossil barnacle calcite and can be used alongside other fossil taxa with different Sr incorporation behaviour. Carbon and oxygen isotope data support the view that the oxygen isotope thermometer for barnacles is robust and that most barnacle species form their calcite in, or near, isotopic equilibrium with ambient water. The Lepadiformes, however, show a tendency for strong co-variation of δ13C with δ18O values and depletion in 13C and 18O which is attributed to isotopic disequilibrium during shell secretion. Strong systematic fluctuations in Mg/Ca ratios over length scales of ca. 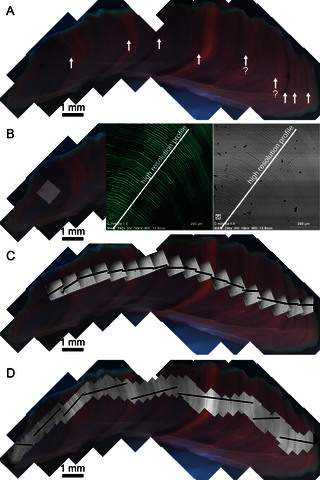 5 to 15 µm are exhibited by the scalpelliform species Capitulum mitella, the only studied species which consistently forms high-Mg-calcite, and are tentatively linked to tidal control on the shell secretion pattern. Cathodoluminescence images for this species suggest that additionally a seasonal pattern of Mn distribution in its shell plates is recorded, pointing to a potential use for reconstruction of seasonal changes in terrestrial element supply. © 2018 The Author(s). Published by Elsevier Ltd. This is an open access article under the CC BY license (http://creativecommons.org/ licenses/by/4.0/).